The walleye is named after its large opaque and almost blind-looking eye. The large reflective surface of its eyes give the walleye a sight advantage over other fish, allowing them to find prey during the night. The walleye has a dark green or olive-green back, light brownish yellow sides, and a white belly. The back is crossed with five to twelve narrow dark bands. The walleye has two dorsal fins, the first having a dark spot at the posterior base of the fin. Walleye are common in most of Canada and the northern U.S., however they have been introduced throughout the United States as far south as Alabama. In Maryland, good walleye populations are found in Deep Creek Lake, Youghiogheny River Reservoir, Jennings Randolph Lake, Savage River Reservoir, Potomac River, and Liberty Reservoir. Walleye rely heavily on stony shoals for spawning. Spawning occurs in the early spring, usually just after ice-out when water temperatures are between 38 - 50 F.
The female broadcasts her eggs, then two or more males release their milt to fertilize the eggs. The eggs are very adhesive, sticking to the rocks and gravel on the shoal. A single female can produce as many as 495,000 eggs. Incubation is from five days to two weeks. The young then leave the spawning areas and grow to be about five to six inches by fall. Fishing for walleye is most productive in the evening using minnow type lures or jigs fished near the bottom over rock piles or along the edges of weed beds. Nightcrawlers and live minnows worked very slowly are also good producers. 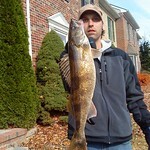 Walleye are considered to be one of the best tasting freshwater fish.